I’ve lived in Cape Town for about twenty years now. It’s considered one of the most beautiful cities in the world—with mountains, beaches and wineries all within easy reach. If you’re a motorcyclist, there’s an endless supply of meandering roads in every direction: the Cederberg mountains and the popular Route 62 are less than a day away. In the CBD itself, you’ll find some of South Africa’s best coffee and food joints. So I’ve rounded up four motorcycle establishments that are within a stone’s throw of each other. 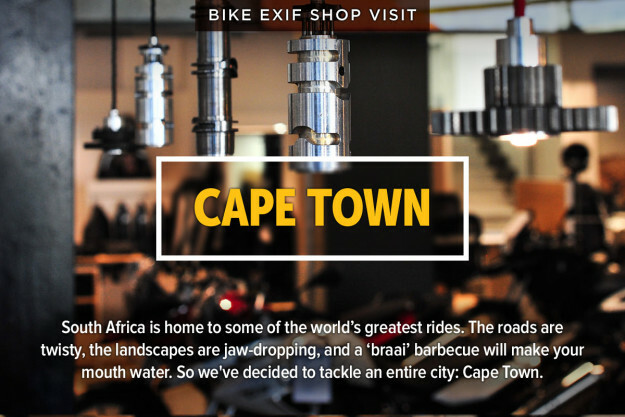 They’re places you should visit if you find yourself in the fairest Cape and in need of a moto-fix, a good coffee or a friendly chat. And they’re all places that I frequent and feel at home at. So if you run into a bearded lad with a Kawasaki W650 at any of them, say hi. 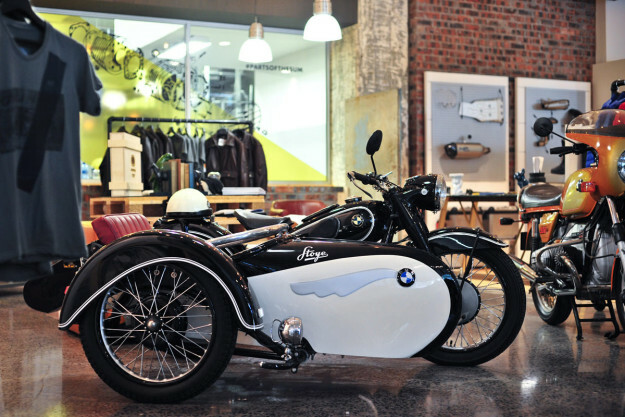 Donford Motorrad Cape Town and Tribe Coffee Roasting Situated squarely on Cape Town’s prominent Buitengracht street, Donford Motorrad is a world-first for BMW: a concept store built entirely around their new “Make Life a Ride” motto. 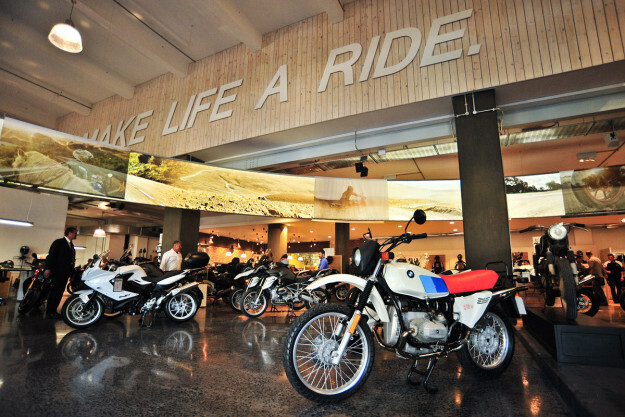 The showroom itself is massive—but there’s more on offer than just new BMW motorcycles and accessories. The shop is packed with classic and custom Beemers—including head honcho Leon Potgieter’s own Dover White BMW R nineT bobber. Local custom shop FD Classic Worx put it together for him, and already have a few more new models on their bench. And Roland Sands’ Concept 90 and Blitz Motorcycles’ custom BMW R nineT have also done time on the floor—thanks to BMW Motorrad head office’s support. Donford have also launched their own ‘Donford Motorwear’ apparel collection. It’s on display in a cosy corner of the shop that includes couches, photos, books, a R90 S and a Stoye sidecar rig. 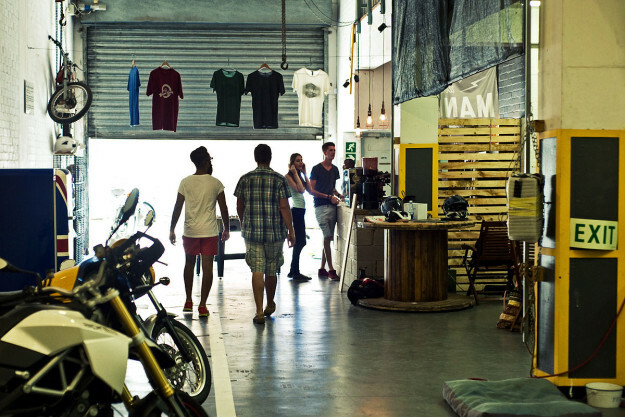 Sharing the premises with the motorcycles is a fully-equipped Tribe Coffee Roasting café. Tribe’s Jake Easton explains how Donford were looking for an espresso machine, and Tribe were looking to open a new location in the area—kicking off an unexpected collaboration. Jake himself is a total motorcycle nut too, so it was a good match. 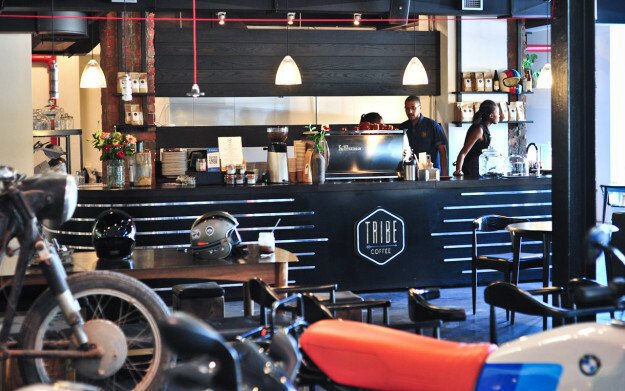 Tribe were given a ton of breathing room when it came to kitting out their space, yet wanted to maintain a strong connection to BMW and motorcycling in general. The main coffee table rests on two unused boxer engines, the down lights are made from various gearbox bits and the silver lines along the counter are meant to invoke those on the classic boxer engine covers. Their espresso, freshly squeezed juices and menu make them a popular breakfast and lunch stop for motorcyclists and regular folk alike. And their iced coffees are just ridiculous. Los Muertos Motorcycles At the foot of Signal Hill lies the historic Bo-Kaap area. That’s where you’ll find Los Muertos Motorcycles—tucked away in an old, re-purposed auto workshop. 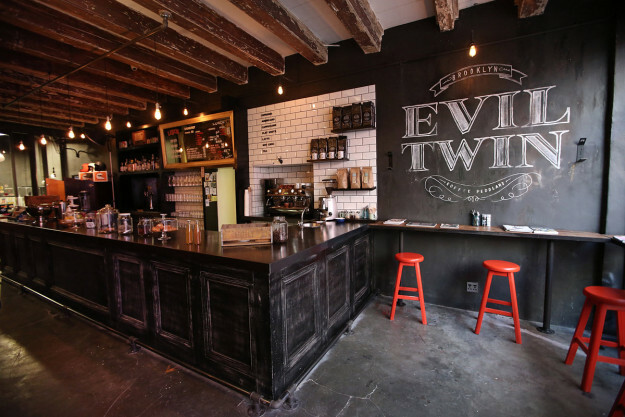 The shop itself combines an espresso bar and a retail space, with rustic furniture and fittings and classic auto-inspired décor. In addition to coffee, Los Muertos serves up nosh from Jason Bakery and Baguette Sandwiches. 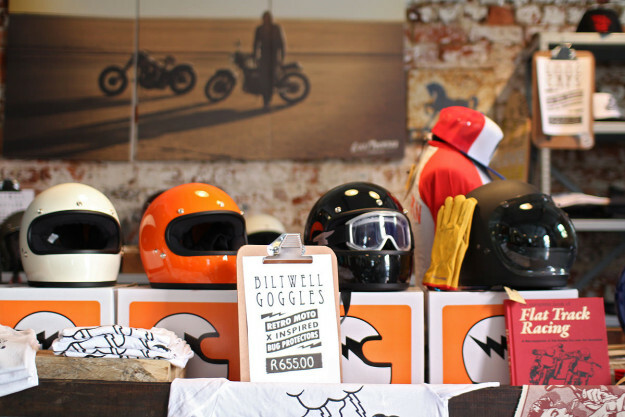 As dry goods go, they stock a mix of their own apparel and items from Biltwell, Stylmartin, Dusty Rebels and the Bombshells, Dickies and Edwin. 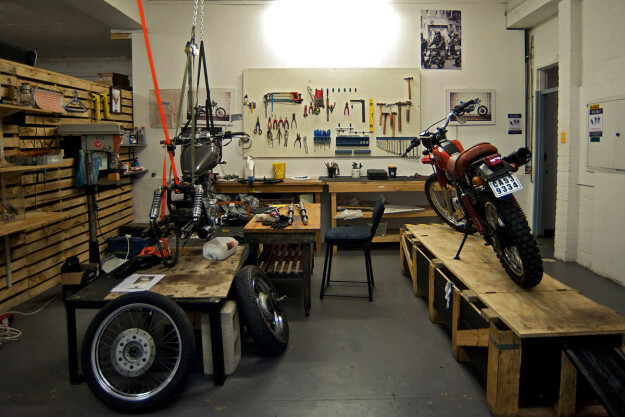 Separating the merchandise from the sit-down area is a row of motorcycles: complete custom builds alongside donor bikes waiting for customers. Los Muertos’ bikes have a vibe that’s as raw and authentic as their shop: part classic South Africa, part punk rock. It’s an aesthetic that carries through to their own merchandise, making it popular among visitors. These visitors range from riders looking for gear, to coffee lovers that have never swung a leg over a bike. Owner Craig Wessels opened the doors in January 2013, combining his love for motorcycles, design and art. Steve Pitt handles operations—he and Craig have known each other since school days, and are equally passionate about motorcycles. 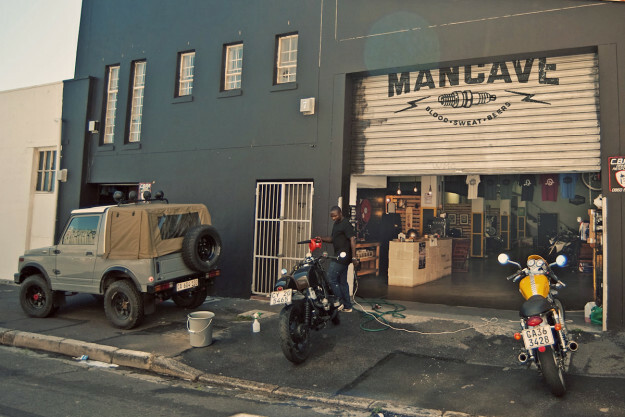 The House of Machines With its paved walkways, Cape Town’s Shortmarket Street has a distinct European vibe to it. 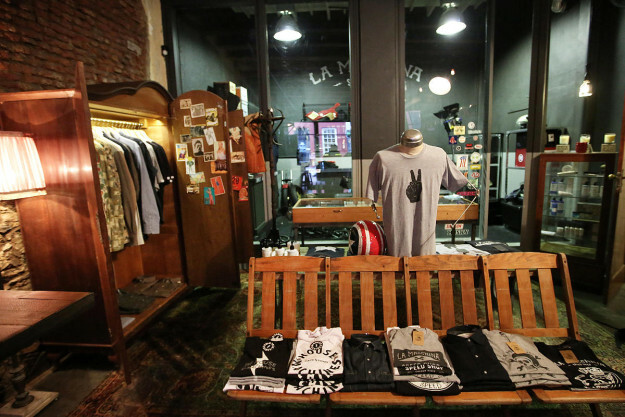 At number 84 you’ll find The House of Machines: equal parts café, cocktail bar, apparel store and live music venue. It’s a place where you can grab an espresso and a bite to eat while watching the world pass by, or a shot of old fashioned bourbon while listening to one of Cape Town’s top musical acts. As a result, it attracts a broad clientele. The location is almost 250 years old. A massive bar counter dominates the space, and at the back goods from Biltwell, Iron & Resin, 100% Barstow and the shop’s own THoM brand adorn the shelves. 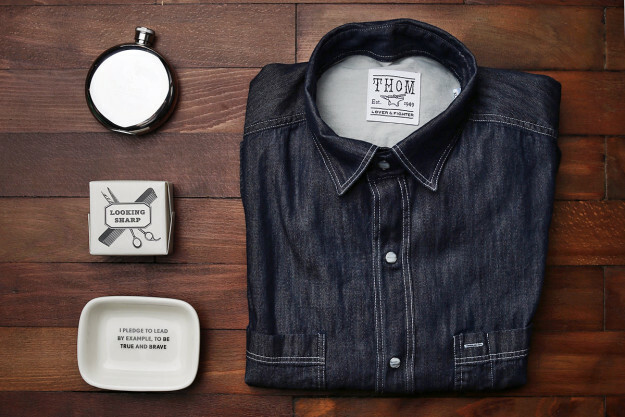 They also stock great “dude gifts” from the likes of Izola, Baxter of California and local company Bonafide Beards. Right at the back, behind a glass pane, is the small La Macchina Speed Shop workshop. It serves as a strip down, planning and assembly area—while the hard graft is handled in collaboration with select custom shops the world over. Currently, La Macchina has a couple of projects on the go with Chris Richardson at California-based LA Speed Shop. The gentlemen behind The House of Machines are Drew Madacsi, Paul van der Spuy, Brad Armitage and Andy Lund. They’ve combined their experience in fields ranging from the corporate world to men’s clothing, beer, coffee, motorcycles and photography to craft the sort of establishment that they’d like to spend time at. Brad’s personal ride is a Honda CB400 street tracker, built by Cape Town’s Stoos Customs. Drew’s is a brutal Harley tracker, put together by the late Larry Pierce of Garage Company in Alabama. 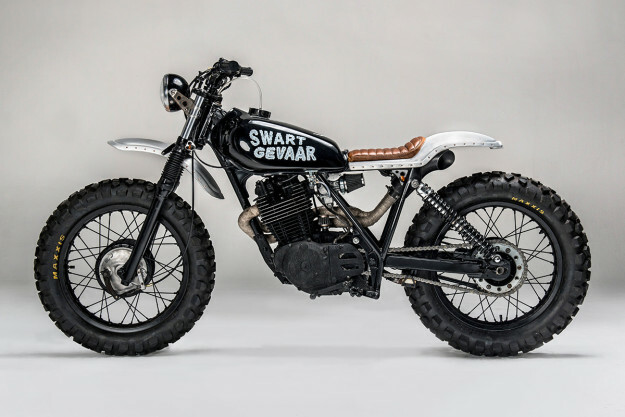 The Woodstock Man Cave Taking inspiration from Australia’s Kustom Kommune and Rising Sun workshops, Devin Paisley and Simon Rice opened the Woodstock Man Cave halfway through 2014. As the name implies, you’ll find it in Woodstock—a stone’s throw from the popular Woodstock Exchange, and in a historically rough area that’s on the up. It’s a communal warehouse offering workshop and parking space to members who live in the city and don’t have space to wrench on their bikes. It’s also a place to “generally do man stuff,” as Devin puts it. You enter through a massive garage door. The main floor is divided between workshop bays and a parking area, with an espresso bar and plenty of space in between for hanging out with your mates. 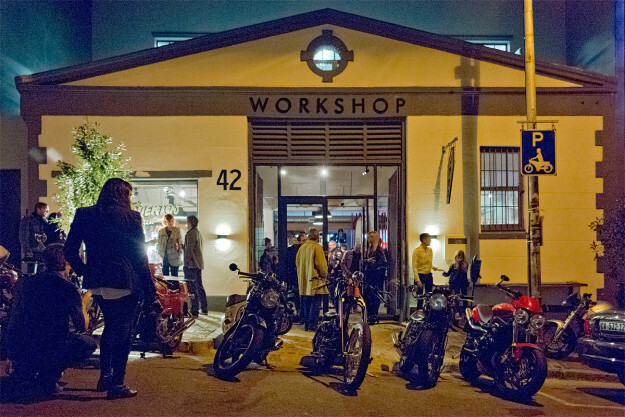 The WMC also host bike film nights, and recently held their first Garage Built Bike Show. And they’re not done yet: they’ve just begun stocking Max-Inc parts, and are planning to convert part of their premises into a more retail-orientated space. Also on the cards are regular group rides, and workshops on the basics of motorcycle maintenance.